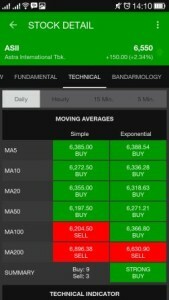 The Buy and Sell signals are based on technical analysis data. This document describes the generation rules to translate technical analysis data into Buy and Sell signals. Moving averages can be used to identify the direction of the trend or define potential support and resistance levels. A simple moving average is formed by computing the average price of a security over a specific number of periods. Exponential moving averages reduce the lag by applying more weight to recent prices. A buy signal is generated when moving average chart curve upward (current moving average value is greater than previous moving average value). A sell signal is generated when moving average chart curve downward (current moving average value is less than previous moving average value). If current moving average value is equal to previous moving average, no signal is generated (Neutral). The Relative Strength Index (RSI) indicator is a momentum oscillator that measures the speed and change of price movements. The overbought / oversold condition is not a buy / sell signal as momentum oscillators can become overbought / oversold and remain so in a strong up / down trend. The overbought / oversold readings serve as an alert to be ready for a turning point. Prices are overbought / oversold, but have yet to actually turn. The StochRSI is an oscillator that measures the level of RSI relative to its high-low range over a set time period. StochRSI applies the Stochastics formula to RSI values, instead of price values. This makes it an indicator of an indicator. The result is an oscillator that fluctuates between 0 and 1. The MACD turns two trend-following indicators, moving averages, into a momentum oscillator by subtracting the longer moving average from the shorter moving average. The MACD fluctuates above and below the zero line as the moving averages converge, cross and diverge. The Average True Range (ATR) is an indicator that measures volatility. ATR will not generate a buy / sell signal, just volatility. The Average Directional Index (ADX) measures trend strength without regard to trend direction. The other two indicators, Plus Directional Indicator (+DI) and Minus Directional Indicator (-DI), complement ADX by defining trend direction. Directional movement is defined by +DI and -DI. In general, the bulls have the edge when +DI is greater than – DI, while the bears have the edge when – DI is greater. Crosses of these directional indicators can be combined with ADX for a complete trading system. CCI measures the current price level relative to an average price level over a given period of time. High positive readings indicate that prices are well above their average, which is a show of strength. Low negative readings indicate that prices are well below their average, which is a show of weakness. The Ultimate Oscillator rises when Buying Pressure is strong and falls when Buying Pressure is weak. The Rate-of-Change (ROC) indicator is a pure momentum oscillator that measures the percent change in price from one period to the next. The ROC calculation compares the current price with the price “n” periods ago. Williams %R oscillates from 0 to -100. Readings from 0 to -20 are considered overbought. Readings from -80 to -100 are considered oversold. User agrees that the use of this software application and it’s information and services is entirely at his/her own risk.